An Interview with Frank van Hasselt, CEO of Clear Village London. Frank van Hasselt is Chief Executive of Clear Village, a London-based charity that helps communities build a better future through creative regeneration. 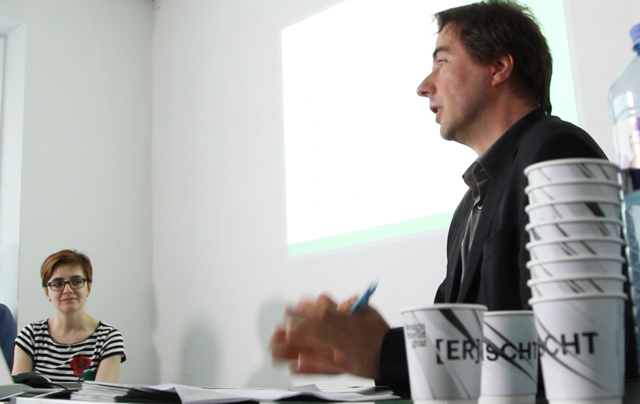 He was a speaker at the Graz symposium “Experimentation Labs Graz – 5 days in Jakomini”. He talked about the Clear Village charity and how stealing from other cities can be a good thing. At the moment we are experiencing a boom in city planning. How do you handle human resources, when there is suddenly such a great increase of interest in the field? People that work on projects like the ones I’m involved in are very flexible and normally do not stay for that long. Since many people volunteer in the field you can’t expect them to stay on your team forever. But that’s completely normal. That is a positive thing though, because you keep a certain flow of new ideas. Right now you are working at Clear Village. How would you explain the organisation to someone who has never heard of it before? We try to activate spaces in London that haven’t been used before. That way we want to reach certain social goals. Now since we are a charity organisation, we have an obligation to reach the goals we have set ourselves. On one hand it is about interconnecting spaces, and on the other hand it deals with social issues. If we worked on projects like Jakomini Graz we would prioritise the social components of the district. Things like businesses or public transport would be side issues for Clear Village. Our work definitely revolves around the social aspect. How would you describe your experience with Human Cities as an urban planner? Human Cities is really great. Their objectives are similar to ours in many ways. We have been involved with the Human Cities team since a long time. Longer than Graz I think. You get to know international conditions. To be honest I would not have known the context that comes with projects like Jakomini. People have different problems around the world. In England we struggle with disappearing social funds. There is just a small budget for the public domain, especially when it comes to social initiatives. We create alternatives, in case we completely run out of public funding. Can you name examples of when you have implemented another cities’ methods in London? We steal almost everything. When looking at topics like self-organising and group activities we think the US is a great example. Their work is very significant in this area. It is funny that we are at the Nothing stops Detroit Exhibition since the city is a big role model in city planning. It is outstanding how much is being done in that city. However, I still find that England is witnessing some very interesting developments at the moment because you can see what happens after an extreme growth in population. It is also fascinating to see what can happen after a complete implosion. London in specific shows how pricing dynamics change through gentrification. Because as soon as you do something locals can appreciate, you can also expect a certain danger of changing prices in an area. We can analyse how people are affected by those changes right now. But since there is nearly no public funding, we have to find a way to do it with little to no money.